NACOGDOCHES, Texas - Stephen F. Austin State University's School of Social Work is one of five Texas entities receiving a $410,000 grant from the Hogg Foundation for Mental Health to support collaborative approaches to well-being in rural communities. 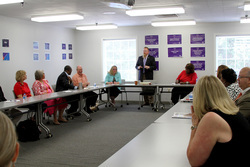 Dr. Steve Cooper, associate director of research for SFA's School of Social Work, said this grant will help determine the steps that need to be taken to improve the county's overall mental health. "The Hogg Foundation looks at rural areas' need for better mental health," Cooper said. "This particular initiative allows the community to say what the issue is. This grant funds the facilitation of a community-driven process of identifying the needs related to mental health and deciding how to go about addressing them." "This isn't just more money to do more of the same things," Rick Ybarra, program officer for the Hogg Foundation, said. "The hope is that these grantees will pioneer new approaches to resilience, mental health and well-being that we can all learn from." According to research conducted by the Hogg Foundation in 2015, 185 Texas counties lacked having a psychiatrist, while 149 of these counties were without a licensed psychologist and 40 lacked having a social worker. The Hogg Foundation's initiative aims to shift the focus from individual mental illnesses to the conditions that support mental health at the community and systems level. "People are often looked at as sick forever if they have chronic mental illness, but with help they can become more independent," Cooper said. "The idea behind this movement is that anyone can get better with support. This means that each member of the community can positively affect an individual's mental health." The Center for Rural Social Work Research and Development within SFA's School of Social Work is housing the grant. Cooper will be spearheading the work along with Dr. Emmerentie Oliphant, director of the Master of Social Work program at SFA. Additionally, students within the School of Social Work will have the opportunity to assist with the process and gain real-world experience. Both undergraduate and graduate students will help gather data on the community's mental well-being, participate in community meetings and more. The grant will last three years, and the initiative is divided into two stages. The first 12 to 18 months will focus on engaging with the community in an appreciative inquiry model to determine the specific mental health needs. In this stage, various community members and organizations will gather information and begin work to enhance the county's mental health care. "This is not just something SFA is doing; instead, it is a community-driven initiative," Cooper said. SFA and 15 community partners will periodically meet throughout the initiative. Cooper said that the group comprises a very inclusive community. "This is the first time Nacogdoches County is focusing on community mental health," Cooper said, "and we anticipate that as word grows, more and more organizations and individuals will want to participate in this initiative." "Our goal with this grant will focus on becoming a trauma-informed community," Cooper said. "Regardless of an individual's own mental health, we want every community member to have access to information and resources regarding their well-being. Everyone deserves help with their mental health."